This French favourite game is rapidly becoming increasingly popular here. Place the jack then compete to get your Boules as close as possible. Our set of 8 polished alloy Boules is packed in a stylish metal carrying case with wooden jack and a measure. Each ball ways 700grams. 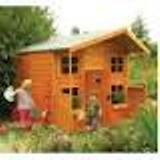 The Hideaway Playhouse with internal floor and ladder. 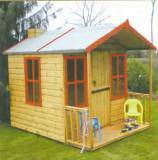 Size 2.48 x 2.49m (8'2 x 8'2) from Rowlinson.